Before I settled in Ubud, I could count the times I’ve ridden a bicycle with my two hands. I was never an outdoor person growing up, so I had no reason to ever want to ride a bicycle other than when my boyfriend gifted me one, after which I forced myself to finally learn how to ride. I was already 19. Three years later, I find myself doing a fellowship with Kopernik and living with a local family in the outskirts of Ubud, where it seems like everyone’s life depends and revolves around one mode of transportation: the motorbike. Even elementary school kids casually ride them through the village’s main street. Beside them, I would feebly ride my boss’s bicycle to and from work, feeling embarrassed, deficient, and afraid for my life. Two things motivated me to learn how to ride an automatic scooter: safety and mobility. I was convinced I’d be much safer riding in the streets if I had the speed to avoid cars and the drivers’ insane habits. I was also tired of only being able to commute down and up the one same street my house is on because the other streets had a steep incline that I would never dare tackle on a pushbike. So I started learning on my second-hand scooter. Initially by small chunks of forward, then stop. Forward, then stop. Then graduating to some ovals in an empty field and eventually to figure eights. My local family witnessed every stage of the learning curve, and must have felt pity for me while watching because they then performed a blessing ritual on my scooter before I took it out into the main street. For my safety, they said. I was very grateful for their concern and compassion. My pretty and blessed Yamaha Mio moped! I am now proud to say that I am a relaxed rider. After enough time had passed, riding became very enjoyable. What I’ve always loved about walking is that you get to use more of your senses to navigate; riding a motorbike is similar because you are more exposed to the environment around you, but the experience is much more thrilling than taking one footstep forward. I can’t count how many times I’ve tried a new restaurant here simply because it smelled wonderful every time I pass by on a motorbike. I am also proud to say that I found the house I currently live in by simply riding down small residential streets and stopping at every sign I see that say “House For Rent” until I found the one. So as you can see, life here really does depend on your motorbike. Save time because one-way streets don’t exist for motorbikes; every street is a two-way street for riders! Now that I’ve crossed “ride a scooter” off my things-to-learn list, I can work on checking off “drive stick shift” and a new one on the list: “ride a manual transmission motorcycle”. Wish me luck! This entry was posted in Bali, Do and tagged automatic scooters, cindy, explore, transportation in bali. 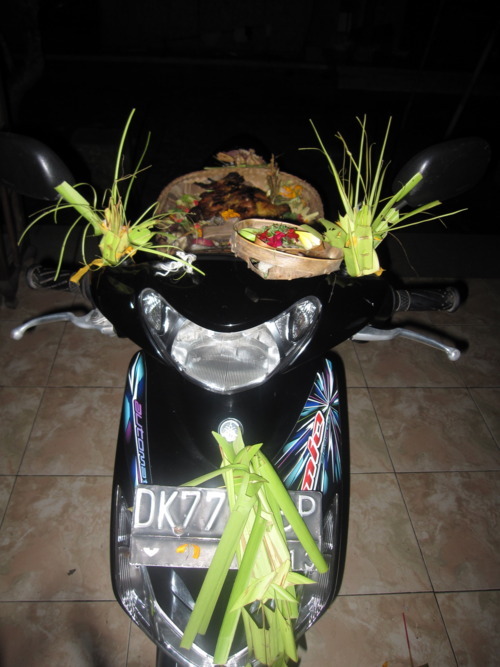 Hahaha, your local family is so cute for blessing your moped for your safety. Seems like you’re becoming a true Bali inhabitant quickly! I guess no license is needed to ride scooters there? Ha you “need” a license, but if you ever get stopped by the police and you happen to “not have it with you”, a small bribe will do. Same goes for driving cars too…in Indonesia, a little money goes a long way. Sad truth about the prevalence of corruption here. Thanks for the above, Sure, the adage which you get what we pay for is genuinely true, however, it happens to be not honest. Let me explain that. The honest fact of you get what we pay for is the genuine import of cause and effect, not always what we pay in any kind of physical currency, but a currency of stamina plus totality. The benefit comes from using even the worst thing correctly like creating lemonade out of lemons plus sweetener. For instance, nuclear power, it’s either a weapon or perhaps a good power source of electricity. The point to that basic example is to create in the mind and reality of the reader that what we use right, no matter what it is, we benefit from. I am sure you’ll do great! If I can do it (I couldn’t even confidently ride a bicycle when I first started learning how to ride a motorbike), I am sure you can too.